Trainers Darren Smith and John Sargent recorded wins at Listed level at Gosford Race Club on Thursday, both with gallopers they had purchased from Inglis select yearling sales. Smith has been a regular buyer at the Inglis Sydney Classic Yearling Sale for many years and his judgement on selecting Testarhythm from the 2009 sale is paying good dividends. Testarhythm ($110,000 2009 Classic, 5g Testa Rossa-Dancing Bridges) took his earnings to $310,000 today when he scored over Soledad and Uate to win the Listed Takeover Target Stakes (1200m). The son of Testa Rossa has won five of 15 starts for Smith, who purchased the galloper for $110,000 from the draft of Widden Stud at the Classic Sale. Widden Stud is set to present a strong draft of 52 yearlings at this year’s Inglis Sydney Classic Yearling Sale - Summer Book on 20 & 21 January. Earlier in the day John Sargent’s red hot Cathay Lady was headed in the Listed Belle Of The Turf Stakes (1600m) but fought back to record her first black-type win. "She had to lift off the canvas but I knew she would keep fighting," winning jockey Blake Shinn said. "It was just a matter of whether the others had a bit more brilliance but it came down to a hard slog and she prevailed." Shinn was booked to ride Takeover Target winner Testarhythm the very next race but was stood down after fainting and was replaced by Brenton Avdulla. 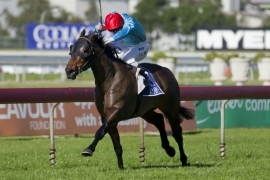 From a family littered with stakes winners Cathay Lady ($130,000 2010 Easter, 4m Exceed And Excel-Kerimba) is now a very valuable stakes winning mare, worth much more than the $130,000 Sargent paid for her from the draft of Kia Ora Stud at the 2010 Inglis Australian Easter Yearling Sale. Cathay Lady has had 19 career starts for seven wins and nine placings, with earnings of $190,000 so far. Kia Ora Stud will offer Cathay Lady’s yearling sister as Lot 455 at this year’s Inglis Melbourne Premier Yearling Sale. The filly will be one of 17 yearlings by Exceed And Excel to be offered on March 3 to 6 at Oaklands.